One of the best things about being Comics News Editor for Forces of Geek! is that, on occasion, people send me some really cool stuff. Last week I had one of those occasions. There in my inbox, shining like a beacon of hope in desperate times, was Deadheaven Book I: The Sanguine Harbingers by Christopher Steininger. I was immediately taken by the look of this book. 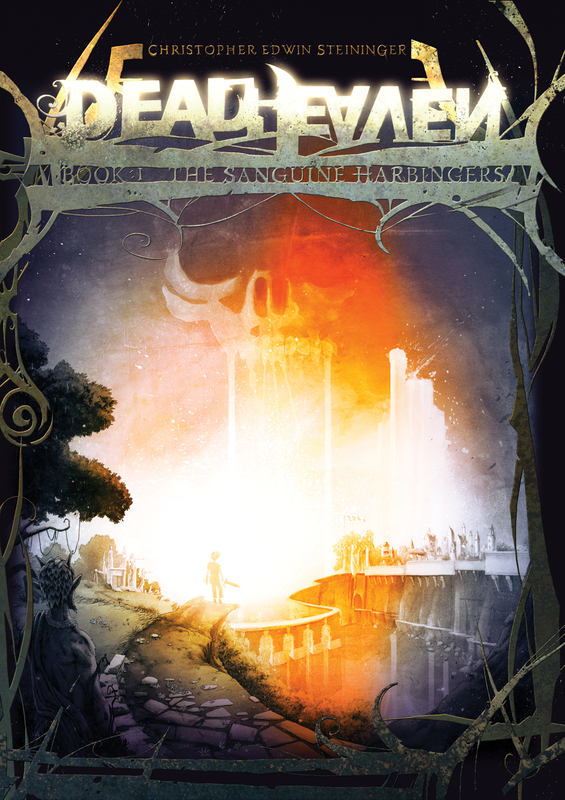 Deadheaven is a 52 page, full color, oversized hardcovered thing of beauty. The artwork is simply gorgeous. 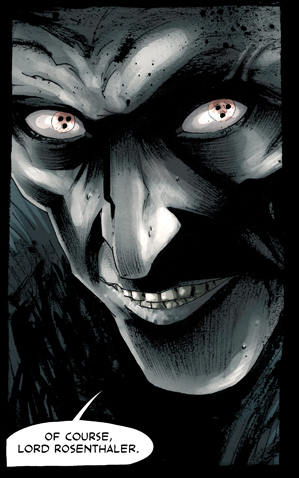 Ben Templesmith, artist on 30 Days of Night and Wormwood, has said of Deadheaven, “The book is beautiful. It makes my brain melt.” I couldn’t agree more. The story, a fantasy adventure full of monsters and warriors, is epic in scale. This being the first of a proposed ten book series, it lays out a huge world full of political and religious intrigue, family dramas, and classic good vs. evil confrontations. After reading Deadheaven, I wanted to know more about it. I contacted Steininger and asked him some questions about the book, his influences, his process, and what more we can expect from him. FOG! : Tell me about your background? Christopher Steininger: I am a Canadian, born and raised in Swift Current, Saskatchewan, living in Berlin, Germany since 2008. Throughout my career I’ve worked in the animation and live action film industry as a character designer, storyboard artist, and art director. One of my first loves is comics (obviously) and I’ve worked on several published titles such as World’s of Dungeons & Dragons (Devil’s Due Publishing), Kill the Revisionist! (Ape Entertainment), Beowulf (Markosia), The White Elephant (Alternative Comics) and have recently been featured in Comic Art Now. I’ve also just finished up my duties working as a storyboard/concept artist on 2k Games’ upcoming 3rd person shooter, Spec Ops: The Line. FOG! : What got you into comics? Who are your influences? Christopher Steininger: I think isolation got me into comics. I grew up in the middle of nowhere where the nearest town was 15 km away, and it was fairly small town at that with only about 14,000 people. I had an analog pre-internet childhood so I had to do things to keep myself busy like draw and tell myself stories. As far as what sparked an interest specifically in comics it was Buscema’s Conan, and later in the 90’s it was definitely the Image crowd. I’ve always enjoyed Dave McKean, Kent Williams, Eddie Campbell, Greg Ruth, Mike Mignola, Steve Niles. Somewhere in there is some DragonLance Larry Elmore nostalgia. FOG! : How would you describe DeadHeaven? Christopher Steininger: It’s an intelligent visceral fantasy adventure series aimed at adults. FOG! : Where did you get the idea for the book? Christopher Steininger: I’ve always wanted to do a solo fantasy project, and after moving to Germany in 2008 and doing various touristy things around Europe, I was really inspired to just make the time and do it. Between the scenery and also getting my hands on a lot of European comics, it really rekindled my drive. My previous experiences in the comic world were largely a complete waste of time, so I knew it would be a self-published effort. This led to no rules or limitations on content, which was really freeing. FOG! : How long have you been working on this? Christopher Steininger: Seriously since the beginning of 2009. Although, much of the content has been slowly accumulating for years. It will be an ongoing project for me for the next five or six years, being 10 books in all. FOG! : When it comes to creating comics, could you describe your process? Christopher Steininger: I work I’m sure like most other people. It all starts with the script which is done on dozens of scraps of paper scattered everywhere and Final Draft. I agonize over the script a lot. I’m constantly revisiting it to tweak dialogue and constantly ask myself, “why?”. From here I move into the layout phase which I do digitally in photoshop. I’ve found I can sketch faster in photoshop than I can in the real world now (I don’t know if that’s a good thing). I usually lay out two pages at a time as spreads, so I can see how the left and right pages fit together compositionally. I then print out the sketches at the full size (about 16″ x 20″) and draw and ink them using a light table. While inking I use various brushes with India ink on watercolour paper. Here and there I may add watercolour elements. Then, once inked, I scan them into photoshop and colour them digitally. I do my lettering in Flash. The entire illustration process takes about 12 – 16 hours per page. FOG! : What do you hope the audience takes away from reading DeadHeaven? Christopher Steininger: That sensation of finding a Hustler magazine in a ditch at age 13 in 1989. FOG! : Where can people get a copy of DeadHeaven? FOG! 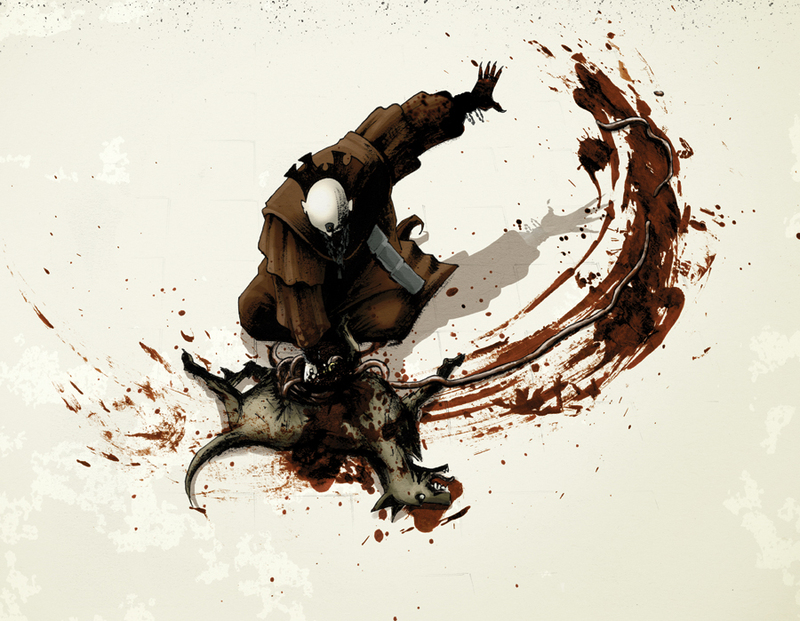 : What have been the biggest challenges you’ve faced doing a creator-owned book? Christopher Steininger: There’s three worlds here. I’ll call them Concept (writing and design), Execution (everything from pencils to pre-press), and Selling the F**king Thing (from promotion to envelopes). Each is more difficult than the last, but all are part of the process. You’ve got to embrace everything whether you like it or not because you’re wearing every hat. I used to think time was going to be a challenge, but that’s just an excuse. You make time. FOG! : What advice would you give someone wanting to do a creator-owned title? Christopher Steininger: Don’t think, just do. If you partner with a publisher be sure and ask yourself what it is they’ll really be doing for you. Quite often it’s nothing you can’t do yourself. FOG! : What else are you working on now? 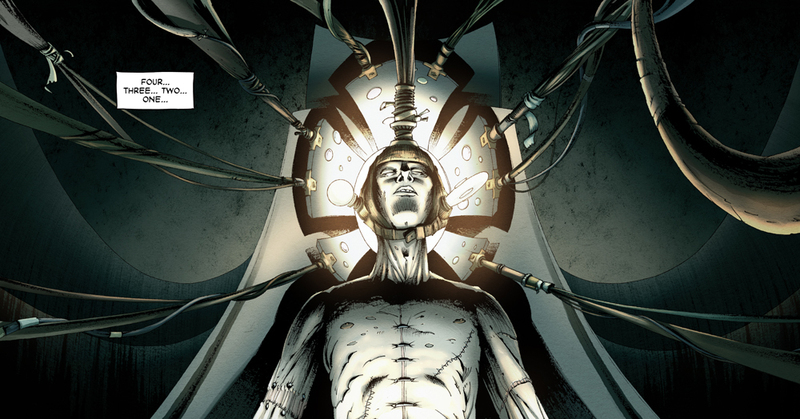 Books like DeadHeaven are why more people should be supporting creator-owned properties. 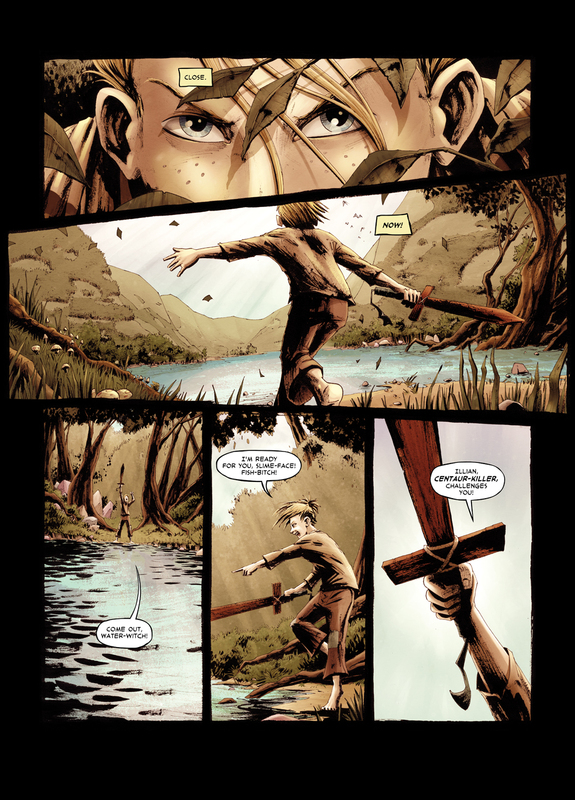 The amount of passion that Christopher Steininger brings to this project is evident in every panel on every page. This is his baby, through and through, and I for one can’t wait to watch his little tyke as it grows up to be a man. I know it is in bad form to end a review with a question, but I can’t help myself: Why aren’t you reading DeadHeaven yet? Why Aren't People Excited About The Apple Watch?